Stack’s LED downlights are packed with sensors that track things like motion and ambient light, and they’ll sync up with the Nest Learning Thermostat, too. Today, they’re getting even smarter, with beefed up, in-app controls for the online automation service IFTTT and an integration with Amazon’s virtual voice assistant Alexa, too. The direct integration also means that you’ll be able to pull up the Alexa app and group your Stack bulbs with other smart bulbs that work directly with the virtual assistant. Those include bulbs from Philips Hue and Lifx, along with bulbs that are tethered to an Alexa-friendly hub, like SmartThings, Insteon or Wink. Group those bulbs with Stack’s bulbs in the Alexa app, and you’ll be able to turn them all on or dim them all down at the same time. 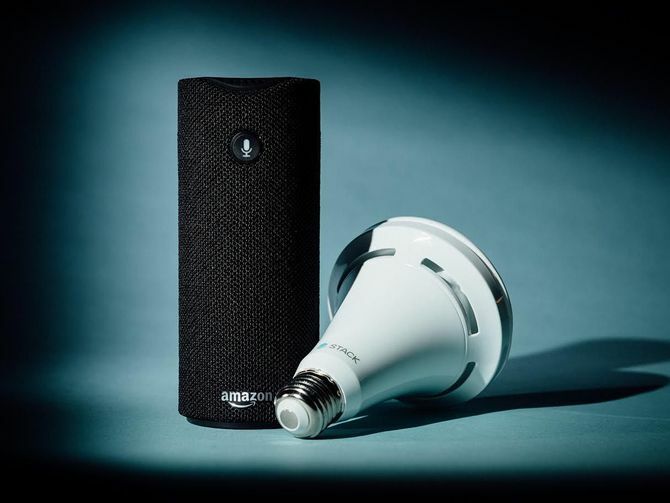 The Stack bulbs will work with all of Amazon’s Alexa-enabled devices, which include the Amazon Echo smart speaker, the Amazon Echo Dot mini-speaker, the Amazon Tap wireless speaker, and the Amazon Fire TV Voice Remote. As for IFTTT, Stack’s bulbs already worked with the free online service, but now, you’ll be able to view your Stack IFTTT recipes from within the Stack app, complete with the option to turn them on and off. With IFTTT, you can use Stack’s motion and ambient light sensors to trigger anything you like — say, logging motion events in a Google Drive spreadsheet, or automatically lowering smart shades when the bulbs detect excess light in the room. You can also use other IFTTT-compatible products and services to trigger lighting changes. Stack’s bulbs held up well when I tested them out, with solid specs and reliable performance. I was also impressed with how well the smart features worked, including the well-polished app and the way they automatically fade up and down during the day based on how bright the natural light in your home is. With Alexa in the picture, the bulbs are an even more attractive option for would-be smart homes. Voice-controlled lighting is one of our favorite smart home setups, and it’s getting increasingly doable thanks to services like Alexa and Apple HomeKit, which lets you turn things on and off using Siri commands. We’ll be sure to test all of the new features out in the CNET Smart Home, along with the new A-shaped Stack Classic bulbs that promise to detect motion through lampshades. Those are due out by the end of the year — stay tuned. To Adopt New Technology Manufacturers Too Slow?